At the start of 2016, Milanese company Savini took over one of London's oldest restaurants, The Criterion. Now an all-day dining destination, the restaurant serves breakfasts, set lunches, and a more extensive à la carte menu in the evenings, and it even has a well-stocked deli counter. Savini at Criterion, 224 Piccadilly, London W1J 9HP, 020-7930 1459. The Silver Room in Mayfair's Hush plays host to a new dining space, Blades. Made to feel like a members-only club, it is in fact open to anyone. Expect the likes of Cornish lobster, different cuts of steak, and a showcase of whiskies including some limited and rarer bottles. Blades, 8 Lancashire Ct., London W1S 1EY, 020-7659 1500. Six Portland Road has opened in Holland Park with pedigree from Terroirs: Oli Barker and head chef Pascal Wiedermann. Expect a fluid, seasonal menu, with approximately 80 wines. Six Portland Road, 6 Portland Rd., London W11 4LA, 020-7229 3130. Closing the doors of its long-term Marylebone pop-up back in 2014, Pieds Nus from David Moore --- the man also behind Pied a Terre and L'Autre Pied --- is looking to reopen as a permanent fixture in Exmouth Market. Plans are for the restaurant to open every day, with later trading hours on weekends. Pieds Nus, 19-21a Exmouth Market, London EC1R 4QD, no phone. Head chef Joo Won has introduced a new gourmet fast food La Nuit menu to Park Lane, available at the Galvin at Windows bar at the top of The London Hilton on Park Lane. Expect the likes of Korean fried chicken, the Galvin's Dog Deluxe, and jam and custard doughnuts. The menu is available from noon to midnight Monday through Friday, and 6 p.m. to midnight on Saturdays. 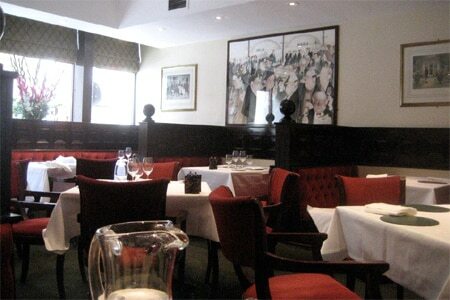 Galvin at Windows, The London Hilton on Park Lane , 22 Park Ln., 28th Floor, London W1K 1BE, 020-7208 4021. Green's Restaurant & Oyster Bar, one of the capital's mainstays when it comes to good, straightforward British cooking, has closed its doors. Simon Parker Bowles plans to open a new location. Green's Restaurant & Oyster Bar, 36 Duke St., London SW1Y 6DF, no phone.